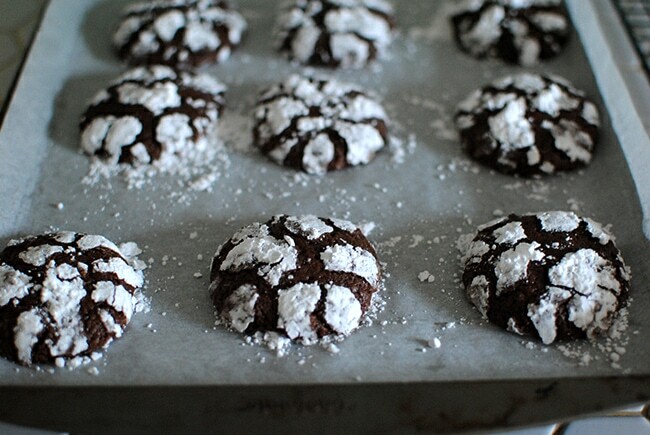 Chocolate Crinkle Cookies are so perfect for Christmas. 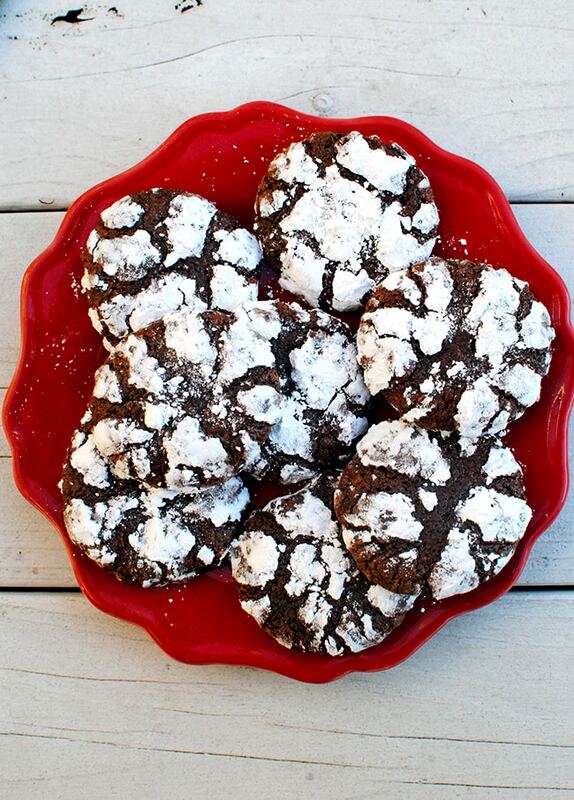 The rich, fudgy chocolate cookies are topped with snowy caps of powdered sugar that cracks — or crinkles — when they bake which gives them a wintry, snow-capped look. If you’re looking for more ideas for this holiday season, check out our full list of Christmas recipes! You can make these chocolate cookies with brownie or cake mix, the recipe is so simple you don’t need to. To make them successfully, first gather all of your ingredients. You’ll need: sugar, vegetable oil, eggs, vanilla extract, flour, baking powder, and salt. If your cookie dough isn’t rolling nicely, place the dough in the fridge for 10 minutes to stiffen it and remove some of the moisture. Don’t press down on the cookies – they will naturally flatten and spread out. As they do, the top will dry faster then the center and will create their classic crackled appearance. To keep the cookies chewy, place them in an airtight container with a small piece of bread. When you’re ready to enjoy them, heat them in the oven at 425°F for 4 to 5 minutes. For the best flavor, enjoy within three days of baking. If you really want to up the chocolate factor, add a few handfuls of chocolate chips to the dough. 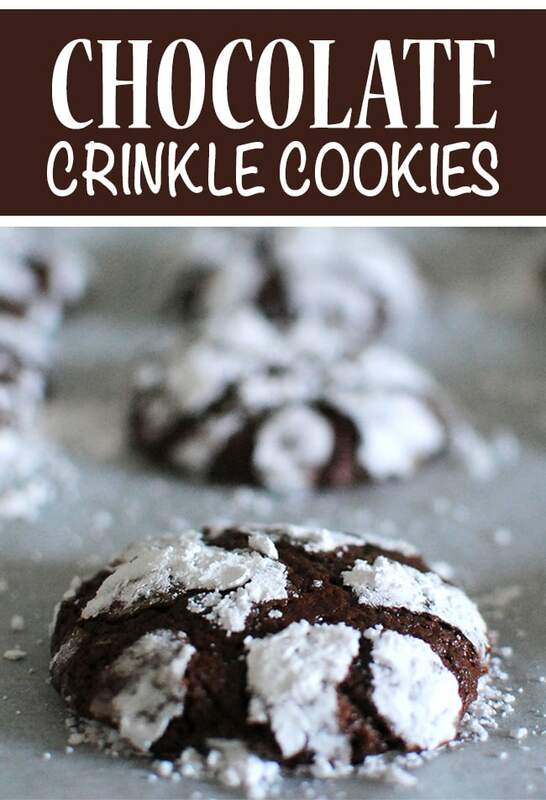 Who Invented Chocolate Crinkle Cookies? It appears that the recipe originated in the first half of the 20 century in the home of Helen Fredell of St. Paul, Minnesota. In the Betty Crocker “Cooky Carnival” (which features Molasses Crinkles), Ms. Crocker writes, “When served at Mrs. Fred Fredell’s in St. Paul, Minnesota, they were so delicious I begged the recipe. Thanks to her, thousands of home have enjoyed these spicy cookies.” Yes, yes we have. That original Molasses Crinkle recipe calls for: sugar, shortening, egg, molasses, flour, baking soda, salt, cloves, cinnamon, and ginger. And, it’s pretty easy to see how we got from Molasses Crinkles to these with just a few tweaks. Swap the shortening for oil, the spices for (a lot more) cocoa, the molasses for vanilla, and roll them powdered sugar. I’m not sure who thought of that, but they were clearly a genius. You can also make red velvet, eggnog, or even gingerbread versions. Once you’ve got the hang of the basic recipe, your creative options are practically endless. These fudgy, delicious holiday cookies are topped with powdered sugar before baking to give them their snow-capped look. Preheat oven to 325°F and line two cookie sheets with parchment paper. Whisk flour, cocoa powder, baking powder, and salt in medium bowl. Set aside. Place eggs, vanilla extract, 1½ cups sugar, and vegetable oil in large bowl. Stir together until fully combined. Heat chocolate in microwave-safe bowl for 2 minutes or until fully melted. Stop to stir every 30 seconds. Add chocolate to egg mixture. Mix for 30 seconds. Add flour mixture to egg mixture. Mix on low until fully combined. Let cookie dough sit at room temperature for 10 minutes, then roll into 1” balls. If dough is too wet, cover with plastic wrap and refrigerate for 10 minutes. Roll balls in ¼ cup granulated sugar, then in powdered sugar, and place on cookie sheet. Bake cookies for 12-14 minutes until they are crinkled. Place the pan on a wire rack and let cool. If you live in the U.K., use the darkest chocolate you can find or use dark chocolate chips. The Chocolate Crinkle Cookies will be a little sweeter. If you find the batter is too sweet, add 1 Tbsp. espresso powder. * It’s ok if they’re still a little soft in the middle. Don’t miss a post by following my blog on Bloglovin’! These look absolutely scrumptious! Perfect for the holidays! I’ve lived in the tropics for the past 7 years, so I have really been missing the snow– not so easy to just go to the mountains! I am home in Oregon and we have been getting dumped on– 2 feet in the past 2 days! And my son and I have been baking cookies and staying warm inside. These chocolate cookies should be added to our list! Oh wow! 2 feet?! That sounds delightful..and cold! Would love to know what you thinks of these! Looks like crinckle cookies are aChristmas staple and I’m pressurised now to make them as well. Some of my favorite Christmas cookies. Yours look better then mine… I’m going to try your recipe on Sunday! Thanks. Thank you! I look forward to hearing what you think! These are so adorable! I bet my kids would love them, but what would you suggest us UK readers replace the unsweetened chocolate with? Dark chocolate? Aw, thank you 🙂 I had no idea it was so hard to find unsweetened chocolate in the UK, but that’s really good to know! I will put an alternative in my notes for the future when a recipe calls for it. If you can’t find unsweetened chocolate, use the darkest chocolate you can find, like this one from Lindt that’s 90% dark chocolate (http://www.tesco.com/groceries/product/details/?id=264587407). They’ll be a little sweeter than these, but should still be tasty. If you find the batter too sweet, you could add one tablespoon of espresso powder to mitigate it. Let me know how they turn out! they look so much like the market bought and are healthier as home cooked. My kids would go crazy over these.They look just so pretty and tempting. Crinkle cookies are beautiful! But I was much happier enjoying them without seeing the caloric content, hahaha. It’s so hard to stop after just one! Haha I totally hear you! Darn you, Google! These cookies are after my own chocolate lover’s heart! They look so good and rich and chocolatey. They would be so great to bring to a holiday party! Cool little bit of history there on how the cookie was discovered! I’ve always been fascinated by how these cookie dry and crinkle. It’s cool to watch! I love crinkle cookies! Adding chocolate just take them to a whole another level for me. I can’t wait to make a batch for Christmas! 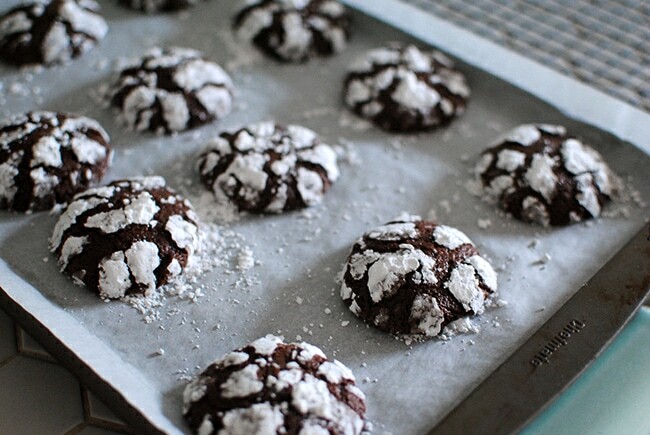 I love love love chocolate crinkle cookies! I used to make them every year for Christmas with my mom but they were totally called something different back in the day! Now, I love to experiment with different extracts like maple, raspberry, mint, and coconut! I love chocolate crinkle cookies! Already making my list of Christmas cookies and you bet this recipe will be on it! Yum, these cookies look delicious! I am going to have to save this for a bake sale coming up! This looks amazing! Super easy to make and perfect for the upcoming holidays .. these are one of my favorite cookies and I can’t wait to make these! All that chocolate is calling my name! I wish I had one right now with a big glass of milk. These would be perfect to go on my Christmas Cookie tray this year.